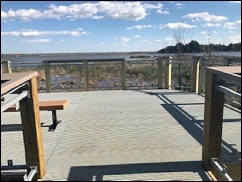 The Department of Natural Resources and Environmental Control wanted to add a viewing tower on the Delaware Bayshore Byway for the public to enjoy the beautiful scenery and wildlife. The structure had to be handicap accessible. The enhanced viewing area required a height of 10+ feet above grade. In order to not disrupt or damage wildlife habitats during construction, Breslin Contracting had to adhere to the strict guidelines of the Department of Natural Resources and Environmental Control. Breslin Contracting was awarded the project in the beginning of January 2018 and started working with Aaron Siemanowski from Siemanowski Engineering who helped to finalize the helical pile design for the project. 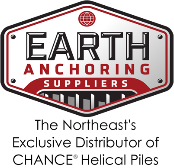 Breslin installed (31) battered CHANCE SS5 square shaft helical piles, (25) CHANCE SS5 square shaft transitioned to CHANCE 2875.203 round shaft helical piles and (18) CHANCE SS5 square shaft transitioned to 2875.276 helical piles. The wall thickness of the (18) round shaft helical piles was increased from.203 to.276 due to the height requirement of the exposed above grade extension. Even with the excessive rain the region received in the late summer, Breslin completed the project on time. 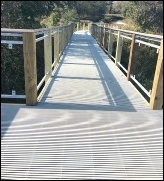 The new installation now provides easy access and a stunning view of the wildlife for all.